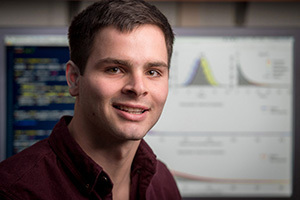 John Huber, a University of Notre Dame senior majoring in applied and computational mathematics and statistics, has been awarded a Gates Cambridge Scholarship to pursue a master’s degree at the University of Cambridge. Huber is one of only 36 students in the U.S. to be selected for the scholarship, which drew approximately 800 applicants. This prestigious postgraduate scholarship program, which fully funds postgraduate study and research in any subject at the University of Cambridge, was established through a $210 million donation to the University of Cambridge from the Bill and Melinda Gates Foundation in 2000; this remains the largest single donation to a U.K. university. In addition to outstanding academic achievement, the Gates Cambridge Scholarship places emphasis on social leadership in its selection process, as the mission of the program is to create a global network of future leaders committed to improving the lives of others. Huber, a native of Gainesville, Florida, will pursue the M.Phil. degree in veterinary science in Cambridge’s Department of Veterinary Medicine. During his undergraduate studies, he developed a strong passion for infectious disease research, which he considers the intersection of his interests in global health, mathematics and social justice. To date, his research has focused on constructing mathematical models for the transmission of mosquito-borne pathogens, principally malaria and dengue. He has conducted his research under the guidance of Alex Perkins, Notre Dame’s Eck Family Assistant Professor of Biological Sciences and member of the Eck Institute for Global Health, and Erin Mordecai, an assistant professor of biology at Stanford University. His most recent research project, which was published in Malaria Journal, focused on quantifying serial and generation intervals, important epidemiological metrics, for Plasmodium falciparum malaria. At Cambridge, he will broaden his research interests by applying mathematical and statistical methods to capture heterogeneity in bacterial division rates. This project will expand our understanding of how antimicrobial resistance arises from slow-replicating bacteria in vivo. Huber was a participant in a competitive National Science Foundation Research Experience for Undergraduates (NSF-REU) at Stanford University and received a James F. Andrews Scholarship, which is awarded to select students who participate in a Center for Social Concerns Summer Service Learning Program. His Andrews scholarship funded his participation in the InnerRoads Wilderness Therapy Program in Missoula, Montana, which offers affordable wilderness therapy to underserved Montanan youth. He served as a clinical volunteer at South Bend’s Sister Maura Brannick Health Center and as a volunteer with Diabéticos Saludables in South Bend. Huber intends to complete an M.D.-Ph.D. program and pursue a career in academic medicine. Huber worked closely throughout the application process with Notre Dame’s Flatley Center for Undergraduate Scholarly Engagement (CUSE), which assists undergraduate students and alumni with fellowships applications. Current Notre Dame undergraduates and recent alumni who are interested in applying for national scholarships and fellowships can contact the center at http://cuse.nd.edu. Originally published by William G. Gilroy at news.nd.edu on February 10, 2017.